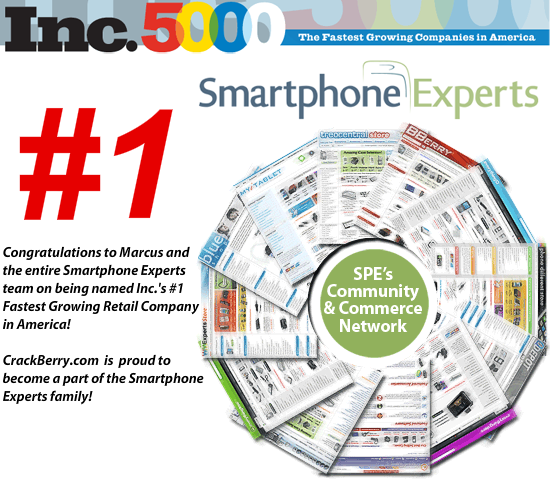 Smartphone Experts is the Fastest Growing Retail Company In America & CrackBerry.com is Glad to Join the Family! Wow, has it ever been an exciting couple of weeks. The Press Release we just published tells part of the tale. I am so happy to be able to announce that CrackBerry.com is now a member of the Smartphone Experts Family. CrackBerry.com is now securely in a position to keep getting bigger and better for years and years to come. And as if this news was not enough, Inc.com has just posted the Inc. 5000 List of the Fastest Growing Companies in America. Guess who's #1 on the list of the Fastest Growing Retail Companies in America? Smart Phone Experts! A big congratulations go to Marcus Adolfsson, SPE's CEO, and the whole Smart Phone Experts team on this fantastic achievement. The "Crack Team" had a hunch in selling CrackBerry.com to SPE that we were putting its ownership into capable hands, and this further validates just how right we were! If you're wondering what this all means for CrackBerry.com and the "Crack Team", don't worry, it's ALL GOOD! The BlackBerry Experts (Addicts?!) that started the site will continue to remain involved in the site's ongoing operation and editorial. CrackBerry.com has been a huge success since going live in February this year, and by taking the strong base we have established and adding Smartphone Experts' knowledge, experience, and resources to the mix there is no doubt The #1 Site for BlackBerry Users (& Abusers!) is going to take BlackBerry Addiction to the next level! Expect to see a new and improved CrackBerry.com store, improved community forums and more frequent content, including indepth reviews. As always, we recognize the importance of separation between media and commerce and our editorial will continue to remain unbiased - we tell things the way they are - good or bad! We have some other top-secret bells and whistles planned for the near future too, so if for some reason you are not yet a member, there has never been a better time to join the CrackBerry community than right now! Things are looking up for CrackBerry.com and Smartphone Experts!